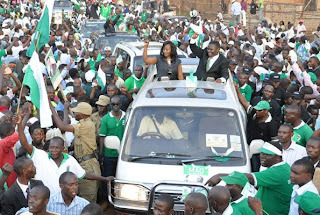 Gulu District chairman Norbert Mao set off on the campaign trail yesterday promising his audience at a speaking event in Kawempe, a Kampala suburb, that his Democratic Party, one of the country’s oldest institutions, will unseat the current leadership democratically – without resorting to the gun. Mr Mao whom the crowds referred to as Uganda’s Barack Obama, a reference to the captivating election of the US president in 2008, spoke at Kawempe Growers Ground and addressed what may be a key constituency with a promise to give the country’s large numbers of youth their rightful share of the national cake. He also promised to restore Buganda Kingdom’s lost glory and grant a federal system of government which he said the ruling NRM had for the last 20 years failed to grant. Mr Mao’s wife, Naome, was at his side as he arrived after 5pm, committing to protect the ordinary Ugandan. “I would like to introduce our President who retired willfully (referring to Ssebaana Kizito) and who is better than this one whom we are going to retire against his will and through the vote,” were Mr Mao’s first words. Mr Ssebaana immediately purred about how the DP has proposed a young, intelligent and energetic candidate who would move the country forward. Mr Mao spoke fluent Luganda, a language widely spoken in the central region. “Those holding guns are entirely dependent on the gun. Those who are spending tax payers’ money on campaigns are dependent on money but we are relying on the ordinary Ugandan and everybody should know that DP has resurrected,” Mr Mao said. Mr Mao’s candidature was encumbered by hurdles with a wing of the party refusing to accept his election at the Mbale delegates’ conference early this year. Yesterday, he appealed to his rivals to “return home”. “We welcome whoever had temporarily taken refuge elsewhere to return home. Whoever fears rain can even seek shelter in a night dancer’s home but the rain is no more,” he said. The crowd laughed.It was symbolic that Mr Mao started his journey in Kawempe North, a constituency represented by party-mate Latif Ssebaggala in this traditional DP enclave of the city. Speaking of his school days, Mr Mao said when he stood for Makerere guild presidency most people, including his father, discouraged him from standing because he was an Acholi and the fact that former President Milton Obote of their neighbour Lango community was blamed for committing atrocities. About the Luweero killings, Mr Mao said since Obote died, President Museveni “has to explain to us who is responsible for the killings there”. On oil revenues, he promised an equitable 50 per cent share between the central government and local governments in districts where the resource occurs.